I have a 10 months old jack russell. He was treated with a very bad hot spot at the back of his neck, they shaved the area and gave him injections and he was on cortisone for about 3 days. I have been rubbing cream on the area that the doctor gave me twice a day as well for 3 weeks now and now the area has turned black and there is still no hairs growing through. Is there something else wrong with him? my jack russell continues to rub the top of her back end by the tail against furniture and often cries while doing it? Have been to vet and other than excercise (which she is walked 5 miles a day about 5 days a week, any clue or suggestion on why this probelm exists? Background, lives with one other Terrier dog and 4 cats, but all seem to get along. I am aware of her need for attention and give as much as possible. I HAVE A 2 YR OLD MALE THAT IS DOING THE SAME THING. 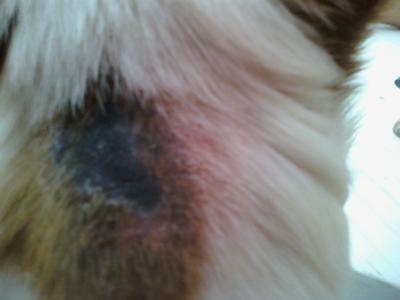 THE VET SAID IT WAS A SKIN CONDITION CALL ECZEMA.THE MEDICINE DID LITTLE TO HELP. I HAVE BEEN PUTTING THE LIQUID OUT OF ALOE PLANT LEAVES ON HIM AND IT WENT AWAY, AND THE HAIR GREW BACK. BUT A FEW MONTHS LATER IT BROKE OUT A LITTLE UP FROM WHERE IT WAS BEFORE. I WAS TOLD THAT APPLE CIDER VINEGAR WOULD HELP.